There have been lots of rumours flying around and I must say that most of them sound believable whilst some not so. It’s just a question of pulling the needle of truth from the haystack of rumours. People are predicting better processors, better camera, better battery and more! I’ll just run through the new basic features according to legend. Firstly, and most importantly, there are rumours of Apple’s new A6 quad-core processor or evolved dual-core A5X. This new processor, reports suggest, will have twice the power and speed of the iPad 2’s A5 processor. A RAM bump is expected from 512MB to maybe 1GB, which would tie in nicely to the oft-rumoured 2048 x 1536 Retina display. Similarly to the iPhone display quadrupling in resolution from 480 x 320 to 960 x 640, the iPad 2’s 1024 x 768 display looks certain to be replaced with a higher-resolution IPS panel, and, with rumours circulating that the new device will be called the iPad HD, this seems a given. 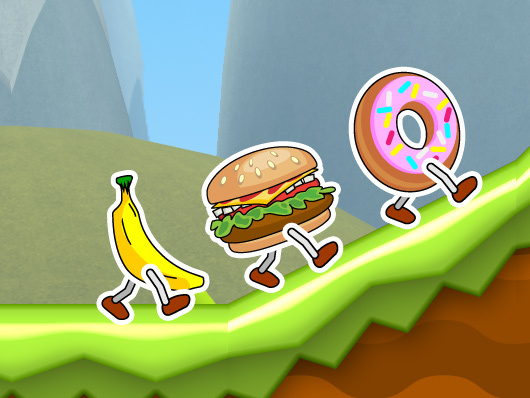 The developers of the upcoming game Food Run had a look at what such a bump would look like, and the results are mouth-watering. Next, we have been hearing about the obvious and very much-anticipated camera upgrade. We are hoping for a iPhone 4S style flash to accompany the new camera. The camera can’t really get any worse, as the iPad 2’s camera was, in my opinion, abysmal. Many are predicting an 8MP camera which would be a huge step up from the iPad 2’s old shooter. Granted, it wouldn’t be anywhere near PureView technology, but the iPhone 4S camera is still one of the best and the use of this unit would be great for tablet photographers. Moving on to the design, rumours suggest that the new iPad may well be thicker than the iPad 2. This may not be all bad news, however, because further sources report plans for an SD card slot that may be built into the main body of the device. It may also have Apple’s renowned Thunderbolt port which, as we all know, is able to transfer data at the speed of 10Gbps. Thunderbolt adoption has thus far been slow, but being added to the iPad could be just what it needs to take off and fight USB 3.0. Rumours are flying around about the thing everybody cares about. The price. It seems that, according to legend, the price will be increased by around £80! With this price tag, we are expecting Apple to do us proud and bring out something revolutionary. Other reports suggest that we will have an iPad HD and an iPad 2S or iPad mini, with a smaller price tag in exchange for lower specs or size. This kind of device would be perfect to take on cheap tablets like Amazon’s Kindle Fire and the upcoming Asus Eee Pad MeMo and could keep the same design and screen resolution as HP tried to do with the TouchPad and never-released TouchPad Go. Finally, the less substantial upgrades. A carbon fibre casing perhaps? Better battery? NFC chip? iOS 5.1 or 6? LTE in countries where such networks exist? Siri? Of course, the rumoured gesture area must not be forgotten, but all will be revealed in tonight and we will be liveblogging the whole event here. Join us tonight at 6PM GMT to find out what Tim Cook has up his sleeve.